It is observed that there is a high static charge on the surface of the fabric during the process of raising the fabric on the fabric surface and after the rubbing on the rollers. The static charge is an undesirable condition because it causes problems such as sticking of the fabric during the machine operation to the surface, exposure of the operator to high electrical shocks and damage of the electronic equipment of the machine. 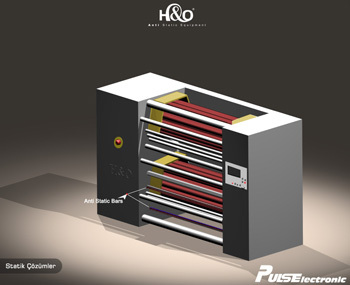 H & O Anti static bars are placed to look at both surfaces of the product. Antistatic bars will neutralize the static electricity on the product surface to relieve the charge, protect the operator and increase productivity.